KLUŚ hermetic boxes are designed for easy connecting and branching of power cables, giving the connections a waterproof rating. They come in two types: Waterproof Splitter - connects three cables to allow for their branching Waterproof Coupler – connects two cables. It allows for making power connections, e.g. supplying power to light fixtures - Waterproof Splitters and Waterproof Couplers are designed for two-wire cables with insulation of circular cross section of outer diameters from 4 mm to 10 mm. If the above are applied, you can lead power cables with voltage 12 and 24V, for example, for the illumination of gardens, facades, landscaping, swimming pools, skating rinks, sports facilities, exhibition facilities, etc. Installation, using the waterproof splitters or waterproof couplers and suitable cables, can be performed in the ground, lawn, under the passageways, etc. Waterproofness of boxes and coupler is ensured by their special design. If you think it fit, you can further secure the cable connections from moisture by filling the splitters or couplers with silicone paste after the cables have been assembled. Connections and branching of the power cables through KLUŚ hermetic boxes do not require any special tools. This only requires simple tools in common use. When tightening the nuts clamping the gaskets on the coupler cables, you need to use two wrenches no. 19. When tightening the nuts clamping the gasket on the box cables, you can simply use one wrench no. 19. The clamping nuts should be tightened with a wrench no 19 with sensitivity, but not too delicately. The lid of the splitter should also be tightened hard. You can do this manually, or use the right tool for increasing the tightening torque (tongs, pliers). The lid and the clamping nuts are equipped with two-start threads for better efficiency in operation, requiring precise positioning before the screwing starts. Waterproof Splitters and waterproof couplers are not designed to be mounted on walls, ceilings, or other objects. In all above cases, they are supported by the power cables, attached to the surface by standard fittings. 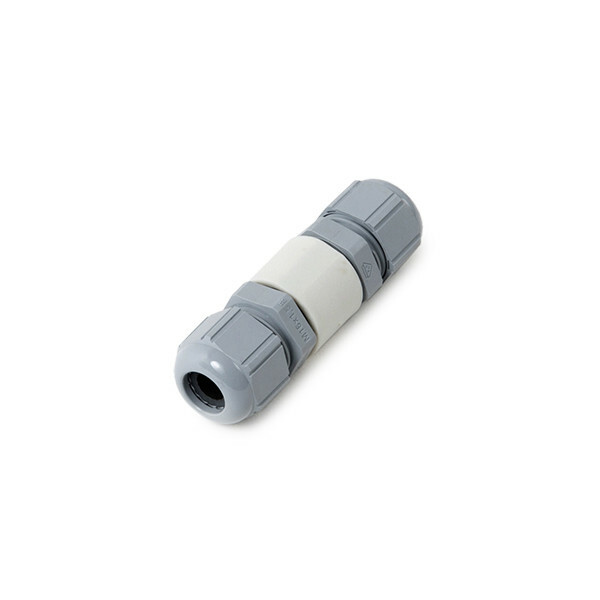 These fittings, located close to splitters or couplers, should be mounted directly on every cable entering a box or coupler, 5 cm. from them. The installation of the cables should be performed in such a way that they do not have to suddenly change directions right at the boxes or couplers. The bending of cables right behind the clamp may cause pressure on the gaskets and consequently gaping. NOTE! While removing a waterproof coupler with installed cables, you must completely loosen one of the clamping nuts, holding the second wrench on the hexagonal element of the clamping nut. After loosening the clamping nut and sliding it off the clamping elements, they should be loosened so that on the further unscrewing of the clamping elements the cable does not rotate together with the elements of the coupler that undergo unscrewing.